Happy National Tree Day ! Our Working Bee on Sunday, 27th July 2014 was a major success. Further work planting up the land adjacent to 60 Main Street was undertaken. 377 plants went in ! Committee sincerely thanks all participants, Arthur for the bickies and Friend Alison for the Tree Day cakes! For a fuller report, please click here. Objectors recently received (28/7) notification that the applicant is seeking to amend the plans to be considered by the VCAT tribunal (on Friday 12th September, 2014 at 10:00 for 1 day at 55 King Street, Melbourne). Existing objectors may choose to amend their statements of grounds at any time prior to the hearing. If you are not currently an objector and wish to be (“joined as a party to the hearing” in VCAT parlance), you’ll need to submit a PNPE9 Form B to VCAT with copies to Council and the applicant. We’ll send a reminder closer to the hearing date to remind Friends who wish to attend. Please click here for some background on this proposal. 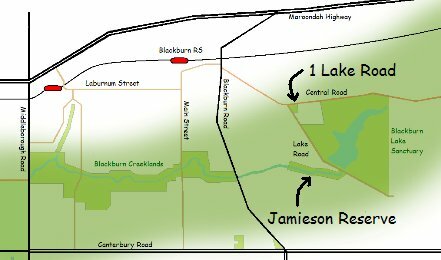 Committee met Council parks and engineering staff at the billabong site on 14/7 to review the project including updated arborist’s opinions concerning nearby trees – some redesign having been done. Council will meet Committee representatives on site again – once the redesign has progressed sufficiently (probably sometime next month). Water will not go to the second overflow pond so as to protect the Yellow Box gums near it from over-saturation. The level of the path between the main billabong and the overflow pond will not change significantly. Thank you Friends for continuing to support our web site. 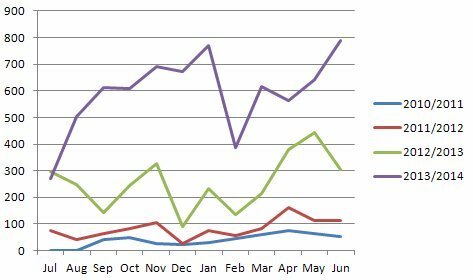 Our stats show we’ve continued the trend of more than doubling our page views every year over the past few years. We attribute the latest year’s growth mainly to our Friends group which has now stabilised at about 170 individuals and families – so, many thanks for your interest. Any suggestions from Friends as to how to improve our web site and/or news bulletins will be very welcome. 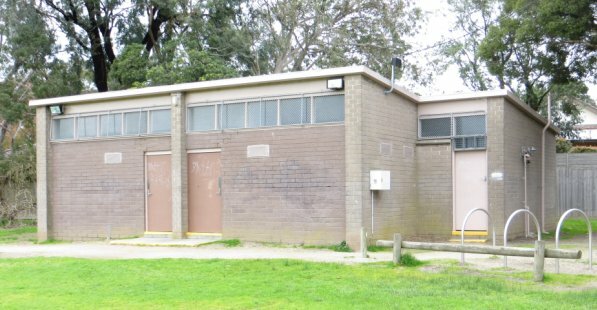 Local residents have concerns about Council plans for the $1.6M upgrade of the 1965 vintage Kalang Oval Pavilion revealed via Council budget news. The scale and expense of the project in relation to current pavilion usage and the limitations of the oval. Potential damage to trees in the park and neighbouring properties. The possibility of the existing parking and traffic safety issues being exacerbated by a larger and/or more highly utilised facility. Issues with Council’s consultation process. Council representatives met with locals at the hall (16/7) and explained that it is following its usual processes for projects of this nature and that residents will be consulted again when plans are firmer. Dads’ Army in the Park ? 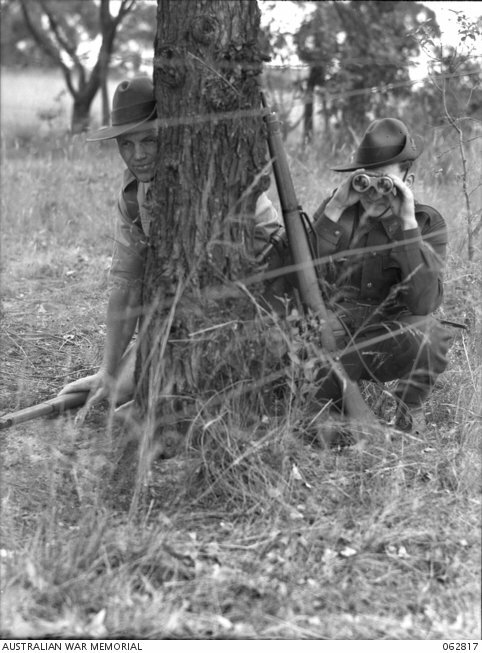 Following up the article in last month’s news, here is another photo from the series the son of one our Friends found on Trove of pictures thought to be of Second World War Volunteer Defence Corps battle practice in the so called “Blackburn Woods” in 1942 and 1944. No-one has shed light on where the “Blackburn Woods” were. We would still be delighted to find out – if you know, or have a relative or friend who might! Or could this be a shot from an early bird count activity ? 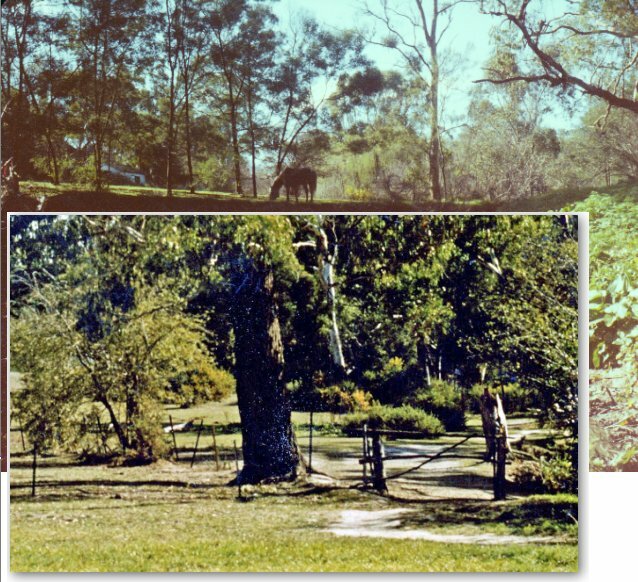 Note that the fencing is not a clue – there were wire fences in the Creeklands right up to the 1980s when the Creeklands were still being used for horse agistment. You may have noticed lots of activity by Whitehorse Council’s Parkswide staff at the corner of Lake Road and Central Road, Blackburn, lately. The land was purchased 8 years ago from the Regis Aged Care facility after much lobbying from the community, Council, State and Federal governments. 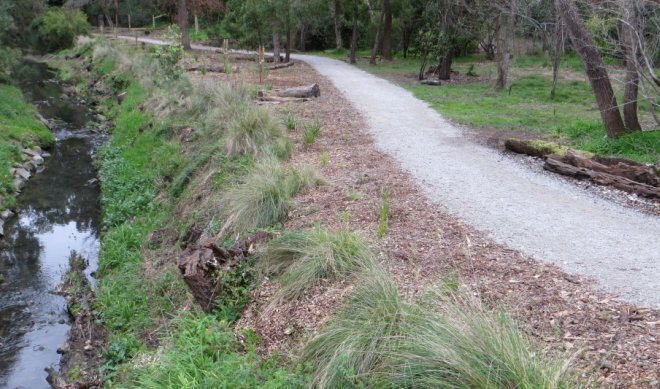 Landscaping – including four ephemeral wetland areas, new paths, removal of woody weeds, new post and rail fencing to link the area with nearby Blackburn Lake Sanctuary and hundreds of indigenous plants have combined with street treatments to transform this land. Seating is also planned. Volunteers have been active too. Over the past 18 months volunteers have weeded in the no mow areas and excellent indigenous grass regeneration is most evident. Weeding is usually every second Wednesday 10 – 12. If you are interested in helping – you can contact Anne 9878 1152. You would be most welcome. Council took the opportunity during the school holidays to level off the car park near the Laburnum Primary School and Scout Hall. Council has planted four Yellow Box eucalypts in Kalang Park south of the creek where the two Monterey pine trees and a Cypress were removed. Further planting in that area is to be done to regenerate the area with indigenous plants and to improve its visual aspect by screening off neighbouring housing. Some park users have expressed disappointment that the trees had to go given their size – even if “woody weeds”. The trees have been removed in line with the Master Plan for the park. Committee has met with Council (10/7) to discuss other woody weed removals – this time, in the land adjacent to 60 Main Street. The work will be done later this year and will include cleaning up the Main Street frontage including removal of the dead Prunus trees, Agapanthus and also similar work in the middle of the area. The large, damaged Pin Oak and nearby Irish Strawberry will remain at this stage. 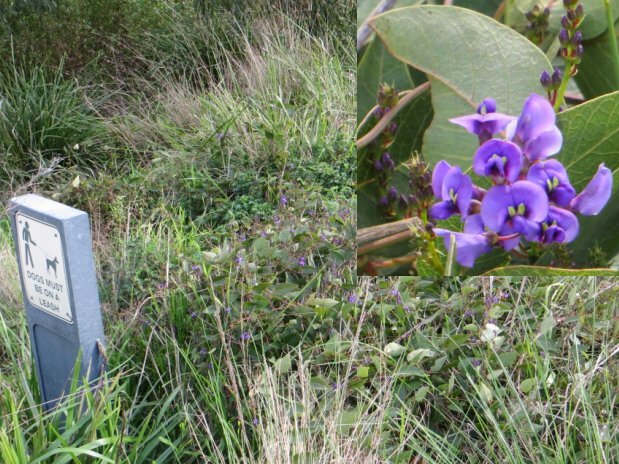 Plant of the Month is the Purple Coral-pea (Hardenbergia violacea). It is a light creeper/scrambler and a favourite of our maintenance team for scrambling over logs/stumps etc. The above example is on the south-west corner of the Main Street bridge in Kalang Park. Though it normally flowers in Spring with striking, mainly purple flowers (see inset), it is flowering early this year. The local indigenous nurseries (Bungalook and Greenlink) can help with suitable plants and advice if you are interested in planting suitable indigenous species at your place. Weed of the Month is Cleavers (Galium aparine) – also called Goosegrass and Stickyweed which is making its reappearance now. Cleavers are prolific annual weeds having straggling stems which branch and grow along the ground to climb over other plants often tending to smother them – attaching themselves with small hooked “sticky” hairs on their leaves and stems. They flower with a small white star from spring to summer which later produces a round green/purple burr which sticks very easily to clothing and animal fur – aiding in the weed’s dispersal. It is native to Europe, North Africa and Asia though has spread almost world-wide. Apparently, geese love enjoy eating it – hence one of its alternative common names. 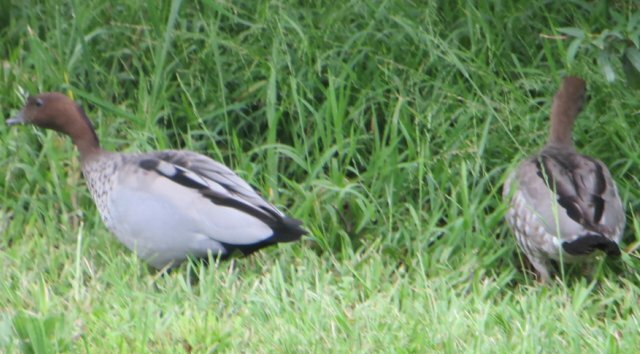 Unfortunately our local Wood Ducks (also known as “Maned Geese” – see the black “mane” on the neck of the male?) don’t seem particularly interested – presumably because it is not part of their native tucker. This is a great shame given the number of the birds we have and the proliferating weed in the park at the moment! Maned Geese – not looking for Cleavers (Furness Park)! Friends Mary and Nan have sighted a single Buff-banded Rail on the northern side of the creek near the Laurel Grove bridge and further west. The Rails have bred in the park over recent years – we’re hoping for more chicks this season. As we enter the breeding season and because Rails spend most of their time on the ground, the importance of dogs being kept on their leashes (as they should always be) cannot be over-emphasised. This entry was posted in Monthly Park Web News, Park highlights this month and tagged 60 Main St, billabong, news, pavilion. Bookmark the permalink.